Winston Pettus Crowder, 84, passed away on Thursday, July 12, 2018, in Houston Texas after courageously enduring serious illness for many years. Winston was a man devoted to his family, faith, service, and to his many friends. He was a loving son, brother, husband, father, uncle, grandfather, and colleague. His unconditional love, loyalty and dry wit will be missed. He is survived by his wife of 52 years, Julia Kathrine Beall Crowder, and their three children: Jerome Winston Pettus Crowder and his wife, Catherine Alicia Krouse; Philip Judson Beall Crowder and his wife Bonnie Michelle Devine, Emily Kathrine Crowder Frazelle and her husband, David Jennings Frazelle, as well as his four grandchildren: Kathrine and John Hunter Crowder and Thomas and Paul Frazelle. Also surviving him is his sister, Rebecca Ann Crowder Shatto, her husband, James; his sister-in-law, Emily Frances Bone; and a wealth of nieces and nephews. Winston was born to Nancy Pettus and James Ralston Crowder on June 25, 1934 in Texarkana, Texas where he grew up and graduated from High School. He attended the Rice Institute in Houston, The University of Texas at Austin, earning a B.B.A. in 1956, and the University of Texas School of Law where he received a J.D. in 1960. He was admitted to the State Bar of Texas and the bar of the Supreme Court of the United States. In 1956, he was commissioned by the U.S. Navy and stationed in Yokuska, Japan. He was proud to serve his country as a Naval Intelligence Officer in both active and reserve duty, retiring from the Naval Reserves as a Commander after 27 years of service. Winston married Julia Kathrine Beall on January 8, 1966 in Houston Texas, and always considered his children and grandchildren to be his greatest achievement. 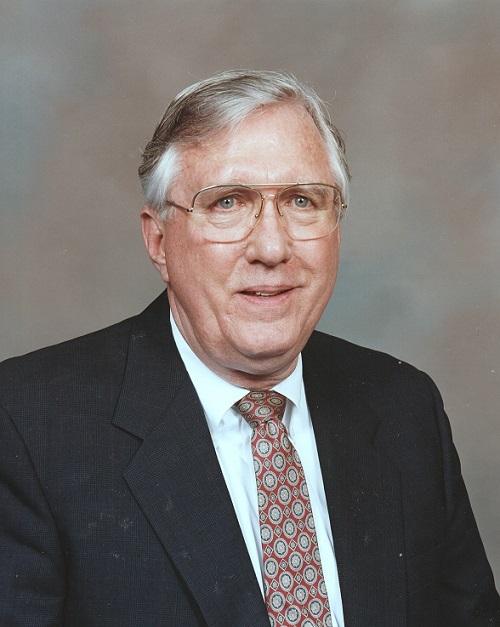 Winston enjoyed practicing law in Houston for 52 years in a variety of positions and capacities, including private practice, and working for the City of Houston, the State of Texas, and the U.S. Department of Justice. No matter where Winston lived, he always volunteered to be a Precinct Judge, participating in local, state and national elections for over 50 years. Known around town for his ubiquitous fedora, his beloved Lincoln Town Cars, and a passion for food and music, Winston was a dedicated family man: once his grandchildren were born, he focused his energy on being with them as much as possible. Besides his love of family and country, Winston was also dedicated to his church, holding memberships in First Presbyterian, Central Presbyterian and St. Phillip Presbyterian Churches in Houston where he served as both Deacon and Elder. In 1999 Winston represented the Presbytery of the New Covenant at the 211th General Assembly. One of his proudest moments was orchestrating the merger of Central Presbyterian with St. Phillip in 2010. Later in life, Winston’s interest in theology, philosophy and humanity came together through his active participation in the Foundation for Contemporary Theology. Winston’s many passions included astronomy, gardening, photography, woodworking, outdoor sports, public service, and gourmet cooking. As a member of the Board of Visitors for McDonald Observatory for 20 years, he eagerly made annual treks to Austin and Ft. Davis to attend meetings and confer with astronomers and technicians. He was particularly excited when learning more about our planet and the universe, surrounding himself with creative thinkers and observers. His green thumb was apparent in both horticulture and forestry; he served as president of the South Texas Unit of the Herb Society of America and planted native trees on properties across the state. As a photographer, Winston was best known for making images of family and friends at gatherings, parties and events, documenting the good times he had with so many people he loved and cared for. Winston’s passion for woodworking and designing and building furniture was evidenced in his handcrafted treehouses, decks, tables, beds, and chairs. He was meticulous in his efforts and detailed in his method, turning out pieces that are still cherished and used today. Winston will also be remembered for his exquisite meals, his hours of poring over cookbooks, his tending to pots on the stove and entrées in the oven. His cookbook collection numbered over 400 volumes. In the 1970s, he competed in a series of snail eating contests sponsored by Antone’s, even winning 3rd place to the amazement of his wife and children! The family is grateful to Dr. Harold Selzman and Carla Ochoa, who extended and expanded Winston’s life through their medical knowledge and graciousness. They feel blessed that Winston had such compassionate caregivers: Gloria Ruiz, Bambi Voss, Cindy Moreno and Rosa Carreño. Winston’s life will be celebrated at eleven o'clock in the morning on Saturday, September 15, 2018, in the sanctuary of Christ Church Cathedral, 1117 Texas Avenue, Houston 77002. Immediately following the service, the internment will take place at the Church’s columbarium to be followed by a reception in Reynolds Hall. Gifts in Winston’s memory may be made to the Foundation for Contemporary Theology, the University of Texas McDonald Observatory or Holly Hall Retirement Community.